Another amazing meetup for TheNextCMO is now in the record books! 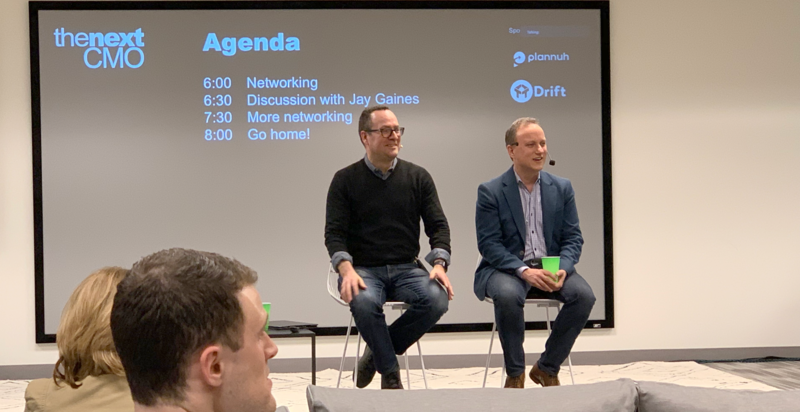 This last meeting, once again hosted in the beautiful Drift offices, featured a conversation with Jay Gaines, CMO and Research Fellow from SiriusDecisions. For those of you who didn’t attend, or even if you did attend and couldn’t keep up with the content, we have summarized some of the key points from the meetup below. Do you know how much of your budget is spent on campaigns? SiriusDecisions does. This nugget definitely registered with us at Plannuh (planning by campaigns is central to the way Plannuh works). During a discussion about metrics, Jay mentioned that one of the key metrics that they track at SiriusDecisions is the percentage of their budget spent on campaigns vs. individual tactics. Speaking of metrics, we had a good discussion about ROI measurement. The key point was that it is difficult to measure the ROI on an individual tactic, but it is easier to measure ROI when you measure at a higher level. We made the comparison to CAC (customer acquisition cost), a key metric for most SaaS companies (simply put, the total cost of marketing, sales and support costs related to customer acquisition divided by the number of customers acquired). The Plannuh team is advocating a measure called return on marketing plan or ROMP, which measures the total cost of the marketing plan and compares it to the total benefit. Are you talking about the right metrics? Do you know what metrics you should be sharing with your board or your CEO? It probably isn’t your web traffic (although there was a good debate about that after the meetup on Twitter). The point made in the meetup was that you need to make sure the metrics you are highlighting are as close a possible to business impact. That doesn’t mean that revenue is the only important metric, but if you have a leading indicator or strategic metric, you need to draw the relationship between that metric and business impact. The role of the chief revenue officer. What is the role of the chief revenue officer versus a chief marketing officer? Does the chief marketing officer report to the chief revenue officer? Do you need both in one company? The answer is that it depends on the needs of the company the capabilities of the team. For example, if the company has a sales culture, sometimes it makes sense to have a chief revenue officer at the top. However, it's important that the chief revenue officer has a perspective and understanding of the nature of marketing. A big cautionary area is when a company gets focused too much on tactical issues because they are trying to hit a quarterly number versus the strategic issues that a chief marketing officer needs to consider. Should marketing operations be combined with sales operations? This is another one of those "it depends" issues. Many companies have only recently developed a real marketing operations capability. You should be careful about trying to fold the function back into sales operations too quickly. Marketing operations requires a great deal of specialization and a focus on marketing performance management, along with planning and marketing budget management. In any case, the functions need to be very closely aligned, especially when it comes to defining and end-to-end process for sales and marketing, measuring performance across the functions, and setting service level agreements. This topic may seem obvious, but we discussed the importance of tight alignment with the CEO. What does that mean? One important factor is tight alignment on objectives. That doesn’t mean that you have objectives defined - it means that the CEO is fully sold on the fact that the objectives, metrics, and targets are the right ones for the business. Being aligned with the CEO is obviously important, but are you also aligned with the other functions? CMOs and marketing leaders often focus on alignment with their sales counterparts, but what about the CFO? Services? Product? HR? The point is that true cross-functional alignment ensures an effective marketing function. The importance of non-marketing experience in a marketing career. This seems to be an evergreen topic for our meetup: what does it take to be a CMO if you aren’t there already? One concrete suggestion was to spend some time outside marketing. People with experience in sales, product, services, general management, or any other function, tend to have a better holistic approach to their role. A great discussion overall - make sure you don’t miss the next meetup!